The reviews for each of the minime's on here seem oddly positive. I got mine from Amazon and like a lot of the reviewers on there, it leaks. Pretty much every day I find it sat in a puddle of water. Mine is sat on a tray so I don't get water everywhere but this can't be a sensible design feature. Water + electricity = lawsuit waiting to happen. It does not equal a brilliant idea!! My original model (not minime, the very original one) that I used for years never leaked once. I bought this little machine just before Christmas in a sale. I did a little research before purchasing like I do with any product and I have been impressed ever since. Using the £30 free voucher(using a £10 voucher on 3 separate occasions) I ordered a few different coffee's to try and I loved them all, whenever I go shopping I tend to get a cappuccino in a Caffè/coffee shop, now I put off going to them and waiting until I get home and have one of the dolce gusto cappuccinos, they're soooo tasty! And works out a lot cheaper. Family and friends come over to try it and love it, some have even bought their own. A must buy for any coffee lovers. I bought my Mini Me recently and I love it. It looks great and it make great drinks. This was a wonderful surprise Christmas present from our son and daughter and has been regularly used ever since. It takes up such a small space on the work top whilst looking stylish, and is easy to keep clean. Dinky place to store spike to keep away pesky lime scale from the nozzle is inspired as our water is very hard so regularly needing to keep nozzle clear. Only downside is having to remember not to fully close pod drawer after use, otherwise it sticks. Otherwise, a super coffee machine. 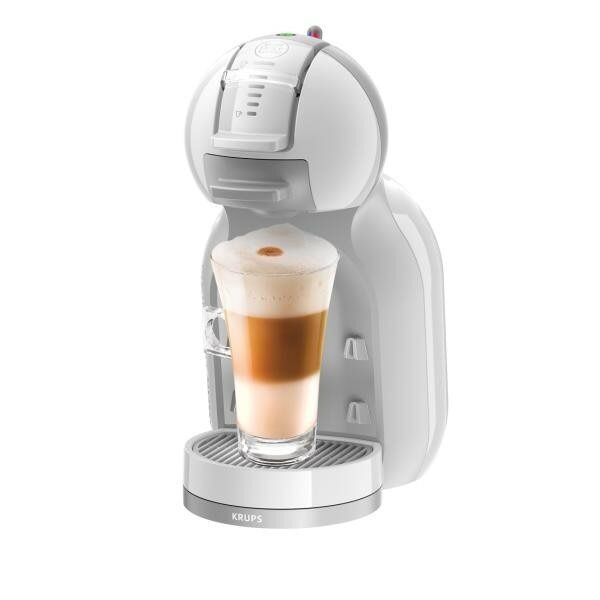 Purchased last year from John Lewis, use it all the time for me and friends and family are always impressed when their drinks come from the Mini. Coffee is good. Machine is great. The best £29.99 spent in years! Would like to always win an upgrade!! Real coffee at home first thing in the morning. I love this machine it is easy to use. Quick with no mess. Every morning without fail I make a coffee using my mini me machine. It is so easy to use, fill with water put in pod switch it on within seconds the green light comes on push the switch to the right and hey presto a fantastic up of cafe-au-lait. Just at the right temperature and a really great taste. The machine is automatic and delivers the same fantastic taste every time. I can't ever think that I could go back to coffee from a jar.